There’s a new sound among the cacophony of noise around Kumba Iron Ore’s Sishen mine in the Northern Cape. 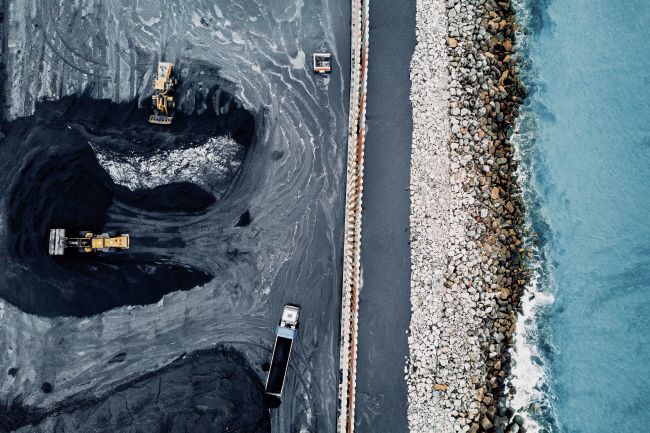 Between the drilling, blasting and loading, you’ll now hear the gentle whirring of a small fleet of unmanned, remotely operated aerial drones in the skies above the mine. Those drones use on-board cameras and laser scanners to create three-dimensional images of ore to calculate volume, and to survey accident scenes and areas deemed unsafe for workers. And while those airborne drones fly about, their pilots will be located in relative comfort and safety, in a control room away from the mine’s more dangerous environments. Ntsoelengoe added that routine tasks around the mine that were previously carried out by surveyors – such as measuring the volume of stockpiles – are now being done by those drones. ‘The drones collect digital imagery that is pieced together to perform volume calculations, giving us reliable data without having to put anyone at risk,’ he said. Kumba’s licence came at the end of an onerous two-year accreditation process. The company – like many others – had been using drones since 2015 but only through third-party service providers. Kumba had to overcome a series of legislative and regulatory hurdles before its own pilots could operate the company’s fleet of drones. In simple terms, South Africa’s Civil Aviation Authority sees commercial drones as equivalent to manned aircraft, so they require a licence to own (renewable every 12 months) and a remote pilot’s licence to fly (renewable every 24 months). Those restrictions have clipped the wings of many mine operators that want to use drones for their own purposes but find the licensing process to be more of a hassle than it’s worth. Still, it’s clearly worth a lot to miners to have a cheaper, safer and more efficient way of doing business. 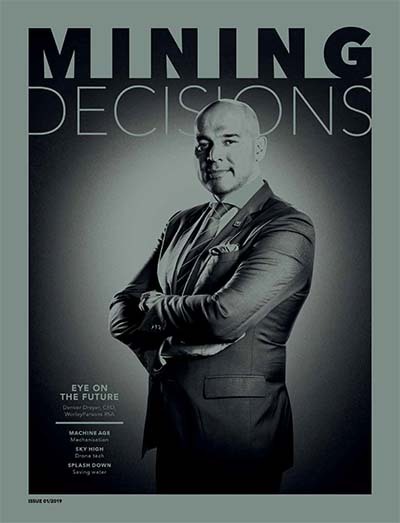 Between 2014 and 2017, Kumba spent a reported ZAR748 million on new technologies in a part of a wider initiative by Anglo American, whose investment in new technologies includes introducing survey drones and remote-controlled drills to improve miner safety by physically distancing workers from potentially dangerous tasks. For Kumba and Anglo, read: everybody. 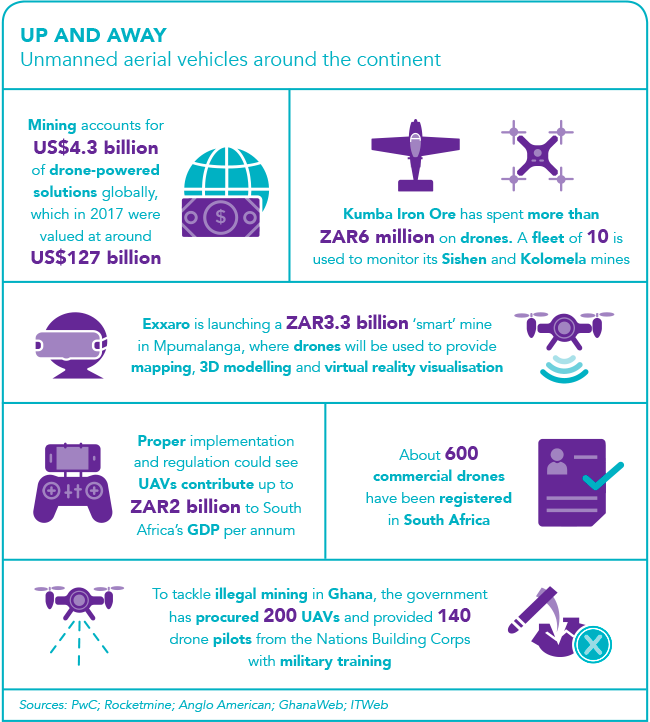 Mines and mining houses across Africa – and, indeed, across the world – are stepping up their development and implementation of drone and unmanned aerial vehicle (UAV) technology as a means to drive costs down and efficiencies up. Drones are generally cheaper, faster and safer than traditional survey methods – and the list of drone applications continues to grow as the technology develops.That, of course, is good news for South Africa’s accredited UAV operators. 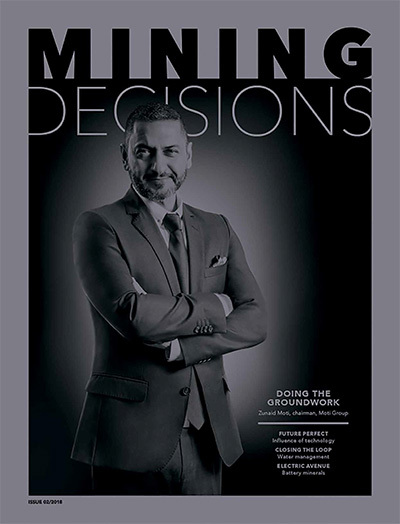 Soon after Kumba’s fleet took flight over Sishen and sister mine Kolomela, local operator Rocketmine announced that it had secured contracts to provide terrain surveying, stockpile inspection, blast monitoring and mapping services to mining companies in Southern and West Africa. In Namibia, Rocketmine will enable the Rio Tinto-owned Rössing Uranium mine to achieve the best possible grade of uranium by using data-gathering drones to optimise the accuracy of planning and inspecting. The company will also provide mine blast monitoring and fragmentation analysis and survey mapping to Newcrest Mining in Côte d’Ivoire and Newmont Akyem in Ghana; and survey and mapping solutions to the Exxaro Resources Group’s Grootegeluk mine in South Africa’s Limpopo province. 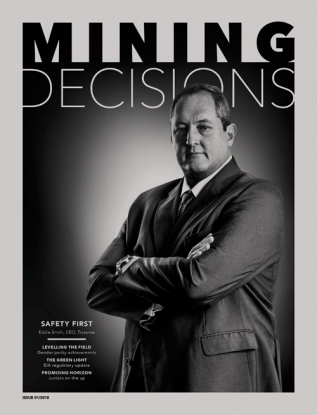 Grootegeluk is Exxaro’s largest opencast mine in the southern hemisphere, with various dangers to human surveyors. As the global market for UAV operations grows, the technology will also continue to develop and improve. Industries such as agriculture, construction, filming and mining – all of which were early adopters of drone technology – appear poised to benefit the most. ‘Right from the beginning there was quite a bit of interest in our service from the mining sector,’ says Kuben Govender, sales director at KwaZulu-Natal-based drone services company DC Geomatics. While Govender is speaking specifically about airborne operations, there’s a growing awareness across the industry of the need for drones to fly under the ground too. Subterranean drones, however, have struggled in the past to navigate the dark, confined spaces typical of underground mining environments – especially when those environments are not conducive to the satellite-based GPS signals that drones typically use to navigate. Yet that too is changing. 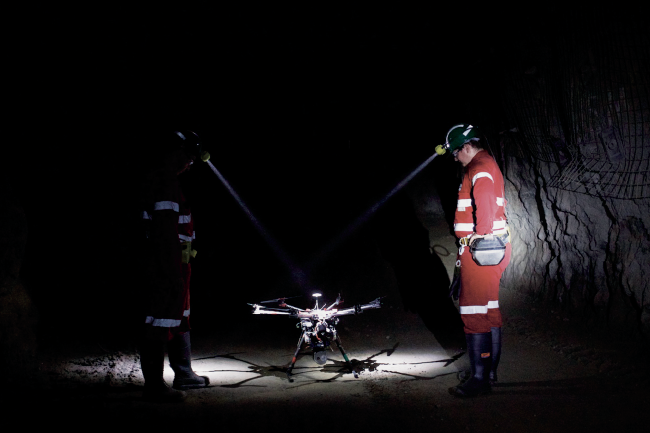 In late 2018 Australian start-up Emesent raised US$2.5 million in funding for its Hovermap system, which enables autonomous drone mapping of underground mines without the use of GPS. As reported by TechCrunch, Hovermap fits standard, off-the-shelf DJI drones with LiDAR sensors and an on-board processor, and then uses simultaneous localisation and mapping (SLAM) technology to provide the drone with the spatial awareness it needs to fly safely. In a TechCrunch article, Emesent CEO Stefan Hrabar explains that underground drone mapping will save miners from doing the ‘dull, dirty and dangerous’ work by using specially equipped autonomous drones instead. DC Geomatics’ Govender, meanwhile, points to another area in which drones are proving their value to mining companies: security. A point that is often lost on people outside the industry is just how massive a mine’s operating area really is. In almost every case, it’s neither practical nor possible to have a guard with a flashlight patrolling the site. ‘We’ve seen a big shift recently from surveying to security,’ says Govender. Again, the utility lies in being able to send an unmanned drone into an environment that’s either unsafe for, or unreachable by, humans. And, as the mining industry as a whole becomes safer, cleaner, more digitalised and more automated, the possibilities of this technology will be pushed ever further.